Independent Since 1910 Review | Do they live up to expectations? This page contains references to diamonds or engagement rings from different companies. Sometimes I do receive a commission when you click on links and buy the products. Since 1910 is a New York based, 5th generation family owned couture jewelry business that’s been in the business since 1910 (hence the name!). Located in downtown Garden City, Long Island, there are currently three generations working alongside each other at H.L.Gross & Bro. 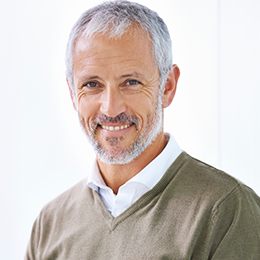 Michael Gross is a 4th generation family member and President, Brad and Matt Gross are 5th generation family members and Vice Presidents, whilst Helene Gross is 3rd generation and treasurer. The brand has built an enviable reputation for creating beautifully designed engagement and wedding rings, as well as offering great prices for big designer names. The brand’s website is user friendly and easy to navigate. As well as an in-depth description of each diamond and ring, there are also clear photos and even a video to ensure that you know exactly what you’re getting. The website also features a comprehensive education section, where you can learn everything you need to know about buying a diamond, including cut, color, and size. There’s also a handy FAQ system that answers a whole host of questions and queries. And, if you can’t find the information you’re looking for, the brand’s contact details are readily available. 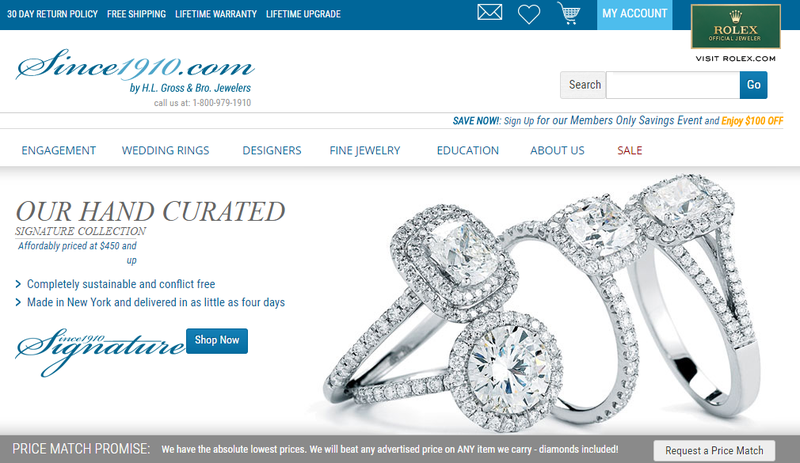 Unlike many other online jewelers, Since 1910 actually started as a bricks and mortar store before moving online. Located in Garden City, NY named H.L. Gross & Bro. Jewelers. 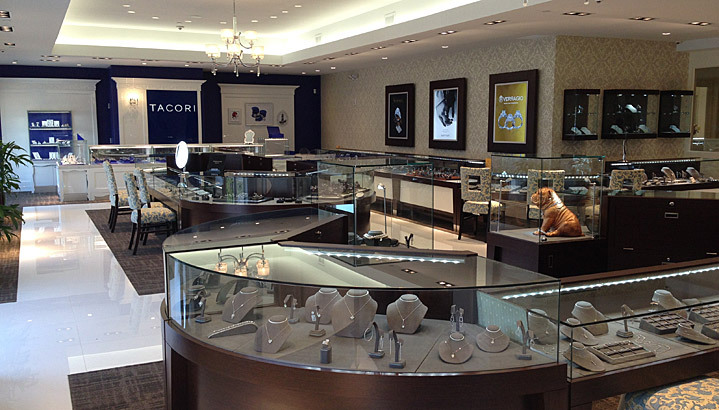 Within the store, there’s three GIA Graduate Gemologists as well as a jewelry manufacturing and repair facility. This means that, as well as viewing the rings and diamonds online, you can also see them face to face. If you’re in New York make sure you visit their store, based at Garden City, NY 11530 and open 7 days a week! One of Since 1910’s main selling points is that it stocks a huge range of engagement rings and wedding rings, including solitaire rings, three stone rings, and eternity rings. In addition to their own designs, Since 1910 is also an authorized dealer for many top bridal designers, such as Tacori, Scott Kay, Vatche, Verragio, Henri Daussi, Martin Flyer, and more. If you’re looking for the best quality diamonds and designer engagement rings, make sure you visit Whiteflash. They stock a whole host of designs from leading names such as Tacori, Vatche, Veraggio, Ritani, Danhov and Simon G and are the exclusive Provider of the impeccable A CUT ABOVE® diamonds. Whilst Since1910.com is a great place to get designer engagement rings at Whiteflash you can get the highest quality cut diamond and designer engagement rings all in one place. If you’re looking for something a little less expensive but without the quality of cut you may want to check out Blue Nile and James Allen who offer a large selection of diamonds and settings. The brand also offers a custom ring facility, where you can choose from over 30,000 diamonds, all of which have been fully certified by the GIA. The brand’s huge range of diamonds includes round, princess, cushion, emerald, radiant, asscher, oval, pear, marquise, and heart shaped cuts. The process is simple and straightforward and can begin by selecting either a setting or diamond, in line with your personal preferences. Members of the prestigious American Gem Society, Since 1910 must adhere to their strict guidelines when it comes to business practices and professionalism. They are also members of the GIA, Jewelers Viligance Committee, The Retail Jewelers of America, and The New York State Jewelers Association. Testament to their commitment to delivering the highest possible quality, all of the engagement and wedding rings sold by Since 1910 contain diamonds with clarity of FL to SI2. Unlike many jewelers, they do not sell I1-I3 clarity diamonds, which have visible flaws. Having built strong relationships dating back over 50 years with the world’s largest diamond suppliers, Since 1910 purchases diamonds direct from the source – eliminating the middleman and passing those savings onto their customers. Since 1910 guarantees the lowest prices in the market place and offers a price match promise to back this up – vowing to beat any advertised price on any item they carry, including diamonds and engagement rings. Since 1910 offers a huge collection of wedding and engagement rings, including designs from many of the industry’s top designer names. In addition to this, as well as their comprehensive, user-friendly website, the brand also boats its own dedicated bricks and mortar store. Get free assistance from the Diamond Guru today. You’ll be glad you did! Secure the best quality diamond for your budget. Don’t pay over the odds for your diamond ring. Have piece of mind that you didn’t get ripped off. © 2017 Your Diamond Guru. All Rights Reserved.